The Signature is in Silver Ink on card, in MINT-NRMT condition. The Signature is in Gold Ink on card, in NRMT-MINT condition. Back of the card is the COA. Collectible AFL card for sale in near mint condition. This item has been graded by Beckett to be in mint condition, 9; centering 10, corners 9.5, edges 9.5, and surface 8.5. Player Grant Hill. Professional Grader Beckett (BGS). Card Manufacturer Classic. 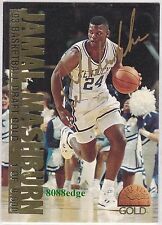 Chris Webber 1993-94 Classic Draft Picks ACETATE DRAFT STARS Rookie Insert Card (1 of 26,000). LOOK THROUGH 100'S OF LOW END BARGAINS. Collectible Card for sale in very good condition.